Next week is the 1st Anniversary Edition and that will be extra special but there never will be another Week 51. The AfterBefore Friday Forum has been adroitly managed by Stacy Fischer for 51 consecutive weeks, allowing anyone with an interest in image post-processing to participate. Guidelines and this week’s edition are available for all to see at her Visual Venturing site. 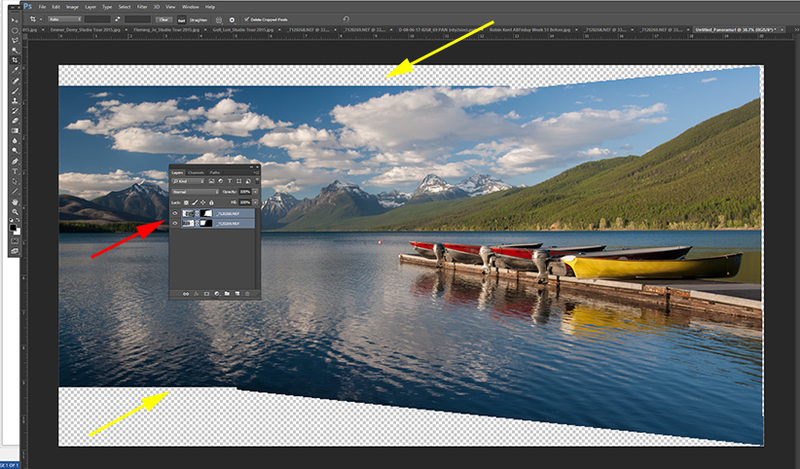 My submission this week takes a look at one of my favorite tools in Photoshop, the Photomerge process. If you have never tried this, it’s really easy to do. For example, let’s stay with the theme of last week—“Road Trip”–and use a location that is a little further west: Lake McDonald in Glacier National Park, Montana. The late afternoon sun made the colorful boats stacked on the dock a natural subject and the result of the first image taken is shown below. But while this was a reasonably decent image, it didn’t seem to convey the great expanse of the scene that I saw. Thinking a panorama format would do the trick, a second shot (same exposure as the first) was taken with the camera swung to the left but partially overlapping the first image. 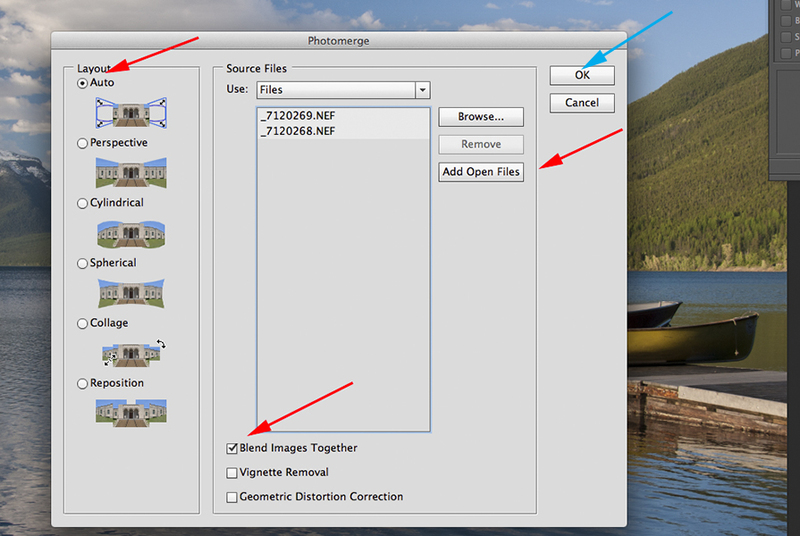 The first step is to click on “Add Open Files,” (Red Arrow) which brings all open images into the list. If any appear that are not supposed to be there, highlight them and click on “Remove.” Most of the time, the “Auto” process will work just fine (Red Arrow.) Make sure you click on “Blend Images Together.” (Red Arrow) Then click “OK.” (Blue Arrow) Something like the screen capture below will appear. The process produces separate layers for each image used. In this case we have only two (Red Arrow). The image must first be flattened before any further work is done (Layer–>Flatten Image). Next, a judicious crop removes the uneven edges (Yellow Arrows) and one is ready to continue with whatever additional adjustments are necessary. Very little additional work was needed at this point. A slight boost in contrast using a Curves Layer Adjustment (Preset: Linear; Blend Mode: Normal), then a neutral density gradient layer for the sky and mountains (Blend Mode: Soft Light), and finally, a teeny bump with a Hue/Saturation Adjustment Layer (Saturation: +6). The final result is shown below. Please visit Stacy Fischer’s Visual Venturing Site to see all of the other submissions. There are always many interesting ideas to be found.